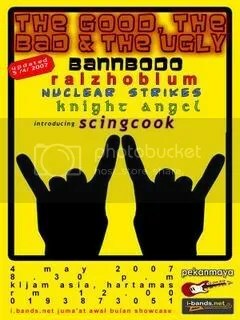 BannBodo – you know who they are… the BADDEST band in town are gonna show KL Jam Asia what heavy metal is REALLYl about! Rizhobium – A band from the Keramat Durjana scene. These guys play damn good traditional trash/heavy metal stuff. Fabulous guitarwork. The most interesting member is Ayen… pure screaming madness (sawan jerit). These guys are brutal with a big ‘B’, and they play a song called “kekejaman” from the Rockers that’s truly mean!! Nuclear Strikes – You also should know who they are. Read the previous post. Scingcook – When I heard this name, I thought these guys must be joking. But when I got to know them, they proved to be more serious musicians than their name implies. Most of the members have their own exciting stage gimmicks. Expect the unexpected. I’m sure this night is going to be the HARDEST night to forget… even in your sleep. So come and feast your ears with glorious NOIZE!! i’ve heard about nucklear strike..
band yg memecah belahkan serta menghancurkan stage university malaya baru2 nie dengan penampilan 80’s serta membawa lagi dari kumpulan stryper n riot. Sebelum nie hampir kesemua line-up band ini (tidak termasuk vocalis asal), menggegarkan gig metal tempatan dengan nama Antacid melalui irama old-school thrash metal yg memang menjadi. bagi aku band ini tahu ape yg mereka lakukan, lebih daripada itu mereka juga adalah scenes serta trend setter sekitar kajang. Amat menakjubkan! Can’t wait to see them destroying kl jam asia. are they play pure traditional THRASH / HEAVY metal as u mentioned????? From my humble opinion, kekejaman is like too ordinary n typical cover song plays by most typical cover band (same as my old band hahahaha. Sorry to say..but nothing special. Playing popular cover song in order to cover weakness of their own song dont make sence at all!!!! i will come to this gig only for the sake of Nucklear Strike! Abg Amir, ur rise of power metal gig is realy superb..but today kenape nak buat gig yg hanya letakan nama band ‘popular’ but nothing special? I agree with you on Nuclear Strikes. Antacid had made a mark in Malaysia underground scene wheater you like it or not. But in a band development, progess sholud be made and some changes should be made in order to reach for the sky. Rex, is trying to add more spices, let us support him by providing good positive feedback. Rizhobium? Let’s just say, some like their milo hot and some like it with ice. In this matter, i should be fair to the bands who are really “eager and move forward” to play. As a band, even though you’re so good in playing, have to admit that the more crowd (not the “bang, masuk free boleh? type) you have..the stronger you became. Sometimes, we need to ask ourselves, what have we done to improve the scene …the answer is in the action & result. I don’t need to know, even. Just keep it to ourselves.